"How about it, scholar? Let's go defeat some evil!" Fact: just because a studio puts up money for a film does not mean it will release it. Studios bury films all the time. The odd thing about this practice is that controversial or "overly artistic" films are the prime targets of studio burials. It's as if they believe films that require people to think are evil. But films with horrid acting, atrocious scripts, and special effects that a snail on morphine could create somehow get released. I've seen quite a few bad movies in my life, and now I have another one to add to my list of those that I would rather have a root canal than watch:The Lost Empire. Let this review serve as a warning: Do not see this movie. Ever. 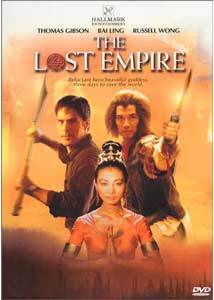 In The Lost Empire, an American scholar of Chinese culture by the name of Nick Orton (Thomas Gibson) has to meet with a Chinese bureaucrat. While waiting, he sees a beautiful woman about to be mowed down by a truck. He saves her life, and it turns out she is the bureaucrat. As he wines and dines her, he notices that the world is apparently falling apart. It turns out that the bureaucrat is actually a goddess, and Nick is the only person who can save the world from five Chinese demons who are destroying a book called Journey To The West. So Nick follows the Goddess into a tomb that is a huge fantasy world. Once there, he frees the Monkey King, a character in the book, from a mountain and the Monkey King becomes his teacher. And so they set off to get the book back. I hardly know where to begin to describe this travesty of a movie. I should point out that it was originally made for TV, which explains its long running time (almost three hours!) and its cheap special effects. But that's still no excuse for the so-called "script." According to the making-of featurette on the disc, the screenwriter read hundreds of real Chinese myths, and then picked six and mixed them into one story. Well, either ancient Chinese myths have no substance, or this movie got stuck with a bad screenwriter. The dialogue here isn't really dialogue, rather it is a string of clich�s repeated by the actors one after another. The plot is also a string of clich�s, making it obvious from almost the beginning how it would end. This makes it all the more frustrating that the movie is almost three hours long. It's also very hard to maintain atmospheres of suspense, or keep the audience interested when everyone knows what will happen next, and what will happen in the end. There are some very fundamental questions never raised in the film, although they should be. For example, why would destroying Journey To The West effectively destroy the world as we know it? At one point the Goddess says, "Certain books forever change the course of human history." Well, that's all well and good. But destroying those books wouldn't erase all the changes they've made, so why this one? The other problem with the story is the way it presents its themes; that is, simplistically. The bad guys represent repression, so of course they're evil through and through. No way we'll see three-dimensional characters in this movie. Another theme is the power of love. This is demonstrated over and over as Nick and the Goddess move through an absurd relationship. The Goddess can't fall in love with Nick without losing her powers, but eventually she finds new power by believing in love. Now, I have no problem with a well-done love story. But this love story is so contrived, and of course the end result is so predictable, that it's painful to watch. Matters are not helped by the actors. Thomas Gibson plays Nick Orton flatly. It's as if he left his emotions on the set of Dharma & Greg. I think Gibson knew the quality of The Lost Empire and acted accordingly. Bai Ling plays the Goddess, and boy can she overact. Every line is excrutiating. But the worst is Russell Wong as the Monkey King: first of all, if the Monkey King is supposed to be Chinese, why couldn't Wong do an Asian accent? He's obviously Asian American, but he speaks with a standard American accent, which ruins the mystique of the character and indeed the entire fantasy world. And then there is Randall Duk Kim as the arch villain, Master Shu, who was supposed to be the prime censor of a 15th century Chinese kingdom. So why does he speak with an accent resembling the mid-Atlantic standard? Or do all Chinese royal officers speak in that highly unnatural and affected tone of voice? Don't get me started on the so-called "special effects." I've vomited better computer effects than appear in this picture. Haven't you ever seen a made for TV "epic"? For some reason, these small special effects companies don't understand the concept of texture. All their special effects look so flat and shiny that they could be made of plastic. Hell, they'd look better if they really were made of plastic! I'd prefer a Muppet to the kind of special effects that these made-for-TV movies have. While the story may have been based on Chinese myths, the final product openly steals from films such as Star Wars,Crouching Tiger, Hidden Dragon,The Matrix, and even Superman II! I'm sure it also steals from Bruce Lee films and other martial arts films that I haven't seen. The director is so blatantly unoriginal that I started shouting at the screen: "That's from Star Wars, you hack!". You know a movie is truly bad when you start screaming at the screen. And by the end I was screaming, "KILL ME!" Image Transfer Review: The Lost Empire is presented in a full screen, nonanamorphic transfer. For the most part, this is a fine transfer. One or two scenes appeared grainy, and a few specks of dust flicked across the screen here and there, but overall it was clean. Colors were sharp, blacks were solid, and detail was pretty high. I'd probably say that this transfer was good enough that they made the bad special effects look even more shiny and smooth, and therefore, worse. Audio Transfer Review: Well, The Lost Empire comes in with Dolby Digital 2.1 sound. That's something new to me, I hadn't heard of 2.1 sound before. And despite the fact that the subwoofer gets its own channel, and despite the large amount of fighting and explosions in the movie, I felt almost no bass. Talk about disappointing. But dialogue can be heard clearly. Extras Review: We get a making-of featurette which is the same old studio fluff: it tells us a lot of nothing. Also, cast and crew info plus production notes are included. The opening menu plays for what feels like ten minutes, but if you click the chapter skip button, it takes you to the main menu. I highly suggest skipping it. The Lost Empire should have stayed that way. I feel violated.